Using only the highest quality materials, the PaintBook will redefine the way you paint as well as enhance your creative experience. 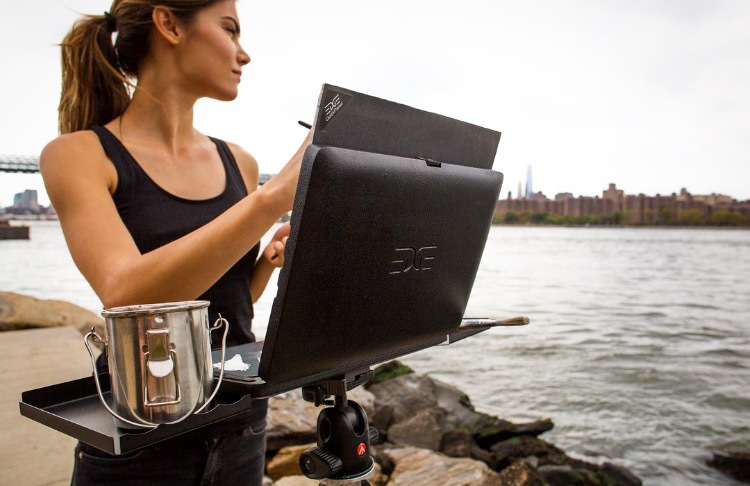 Weighing 4 pounds and slightly over 1 inch thick, the rugged yet elegant structure of the PaintBook is designed for a lifetime of use in the most extreme conditions, as well as in the comfort of your own studio. Each PaintBook is hand crafted from premium plywood and available in a variety of wood finishes along with our original durable black and ochre painted finishes. The PaintBook is made approximately the size of a 16” laptop making it a pleasure to work with in a coffee shop, park, any group setting or social environment. It is compact enough to carry anywhere, yet robust enough to handle medium sized canvases. Another benefit to the size, is that it allows the artist to choose from a plethora of laptop carrying cases and bags allowing for a more personalized setup. Each Paintbook includes our custom, NASA grade, glass palette, which has been designed to withstand years of use as a mixing palette. Fully removable for easy cleaning, it has been coated in a durable, neutral gray finish for easy color viewing. Different color palettes available upon request. The 10"x15" surface area provides maximum surface area for your favorite colors while still remaining compact and discreet. 2” wide by 1/2” deep area around the edge of the palette for closed lid paint storage. Plastic or wooden palette also available. 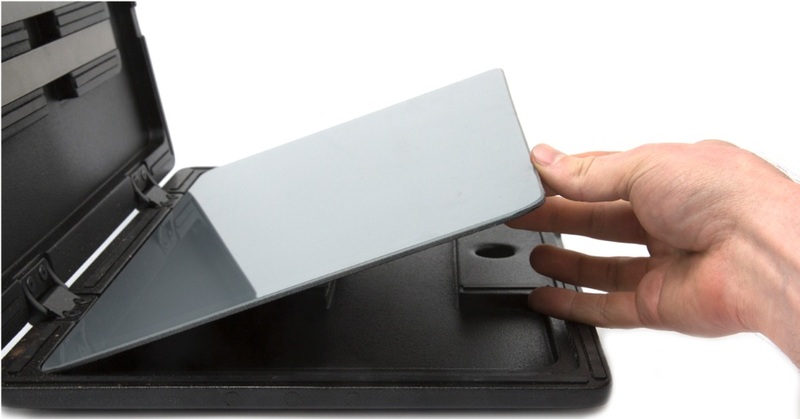 All palettes magnetically attach to the PaintBook and SketchBook for a secure grip. Glass Palette is removable for easier clean up. The glass palette is BREAKABLE. Handle carefully when removing and cleaning. Use the Razor scraper included in your PaintBook and SketchBook Purchase for easy clean up on glass palette. Tip: When wet paint is left on the palette, store the palette in the refrigerator to keep the paint wet for an extended period of time. Our fully adjustable hinges allow for firm positioning up to 180 degrees, supporting repeated brush strokes. Our QuickPanels provide a fast and stable painting surface. QuickPanels are sealed with four coats of acid free white acrylic gesso to assure professional quality. With our patented magnetic system, each QuickPanel can be placed on the lid of the PaintBook and held securely, reducing setup time to mere seconds, while holding up to the most vigorous brush application. 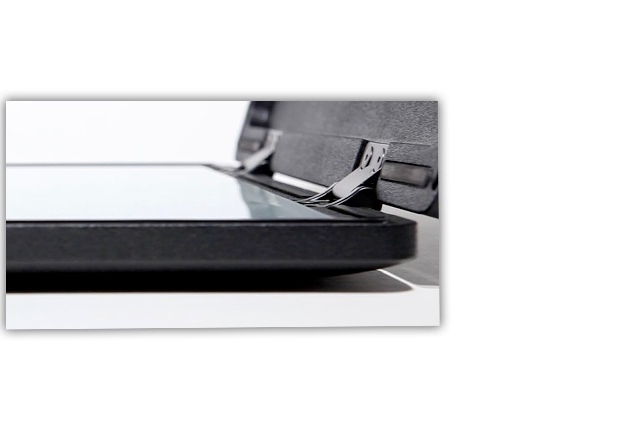 At only 1/8" thick, QuickPanels have been designed for easy storage during travel. Perfect with oil paints and acrylics, the ready-to-paint canvas-like texture gives artists all the advantages of painting on panel, but with the familiar feel of a fine linen or canvas. Providing a premium archival surface. For those who enjoy working with their own panels, the PaintBook has been uniquely designed with our patented slide system to hold all standard panels up to 20" wide. Our slide system has been built with superior quality materials in order to provide strength and versatility when holding the panel. Because of the low-profile design, the panels are held discreetly at each side, allowing full coverage of paint on the canvas. The three points of contact provide a stable painting surface. Canvas Slides accommodating up to 22" wide canvases and XL Canvas Slides accommodating up to 30” wide slides are available as an accessory. *note: The optional larger Canvas Slides have been upgraded to slides with a more secure 2 teeth grip. The upgraded Canvas Slides will fit inside the PaintBook when lid is closed and slides are turned inward. Our one-of-a-kind table design is built to hold all types of brushes and other painting accessories. Made specifically for the PaintBook, each table magnetically locks into place for speed and rigidity. The surface has been coated with a highly durable paint to resist the harshest conditions. Both tables fit easily into any carrying bag. The PaintBook LED Light is a dimmable, daylight balanced (5600°K) LED light designed to combine bright output with a compact, highly flexible form factor using 228 SMD (surface mounted device) LEDs. The PaintBook LED Light produces a 150W equivalent, 70° light beam while maintaining a slim, lightweight, and portable design. The light has a daylight-balanced 5600K color temperature and features a stepless dimmer that lets you adjust the light output from 100% down to 10%. This light runs on battery and comes with charger. Also included is a snap-on 3200K tungsten color filter and an amber diffuser. The PaintBook LED Light, designed specifically for the PaintBook, is mounted to a flexible 19" goose neck for ease of positioning. This Aluminum Tripod with Ball Head extends from 15.7" to a maximum height of 66.9". It weighs 4.9 lb and can hold up to 11 lb of gear. The tripod's 3-section legs have flip locks to individually change the height of each leg. The locks are tension-adjustable to help maintain a tight lock over the tripod's lifespan. Four leg angles allow you to position the tripod in a variety of ways. A rubber grip on one of the legs aids in carrying the tripod, and rubber feet keep it stable on slippery surfaces. Included with the tripod is a shoulder bag for added comfort and protection during transport. The included 496RC2 Compact Ball Head is constructed of die-cast aluminum, has a single re-positionable locking lever, ±90° tilt movement, plus a friction control for precise positioning. An RC2 quick-release plate allows for fast and easy PaintBook attachment. The SketchBook is the little brother to the PaintBook. Weighing only 2lbs and 10.5" wide, the SketchBook is great for the artist who loves to travel light. 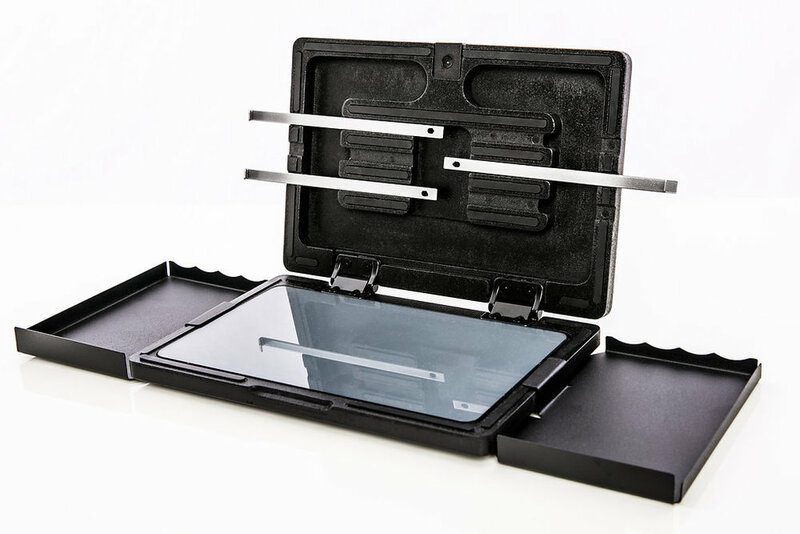 The QuickPanel Capable SketchBook is equipped with a 3 point slide system that will accommodate your own painting panels up to 16" wide as well as our one-of-a-kind QuickPanel gesso painting boards. The magnetic QuickPanel system reduces set up and take down time. The QuickPanel magnetically attaches at the desired location instantly and securely on the PaintBook. Designed for maximum strength and stability, the SketchBook is handcrafted from quality hardwood and painted in our weather resistant, durable black finish. PaintBook shown in Natural finish. SketchBook shown in Rugged Black finish. The SketchBook is made approximately the size of a 11” laptop making it a pleasure to work with in a coffee shop, park, any group setting or social environment. 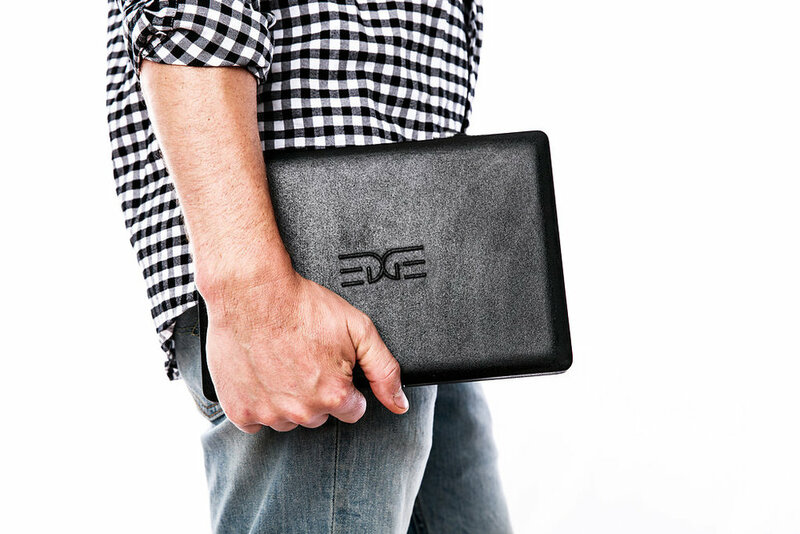 It is compact enough to travel anywhere yet robust enough to handle an 16" sized panel. Another benefit to the size, is that it allows the artist to choose from a plethora of laptop carrying cases and bags allowing for a more personalized setup. The SketchBook and PaintBook are the first portable easels to seamlessly hold a LED light system that illuminates the canvas with bright, daylight balanced light so that any setting is paintable. Painting will no longer be limited to well-lit areas. With our LED Light accessory, the artist can create in any light conditions. This light provides clean daylight color for the highest accuracy in color viewing. The SketchBook LED Light is small in size, yet surprisingly powerful, the SketchBook LED Light uses 36 daylight-balanced LEDs to provide the equivalent output of a 40-watt bulb producing light with a daylight balanced color temperature of 5600K. Powered by only three AAA batteries, the unit will run for up to 2 hours per battery set (one set of 3 batteries included). The SketchBook LED Light, is designed specifically for the SketchBook and mounted to a flexible 12" goose neck to eliminate glare or falloff with ease of positioning. The SketchBook comes with a removable Glass Palette. Glass is the number one material preferred by professional artists for palettes due to its smooth mixing surface and the ability for easy cleanup. A cavity is designed into the lid of the SketchBook to allow paint to stay on the palette even when the SketchBook is closed. The palette is made removable for easy cleaning and comes in a neutral grey color. (different color palette available upon request). Made specifically for the SketchBook, each table magnetically locks into place for speed and rigidity. This all-metal tripod has strength combined with compact size and lightweight to travel with ease. The full size tripod with 3-way panhead and quick release shoe for easy mounting and removal of the SketchBook. 1 QuickPanel Adhesive 4 x 6"
The Charcoal Sachet has been in development for over 10 years. After working with various artists we have come up with a unique custom fabric that works with the charcoal to both blend and release a specific amount onto the paper to create special textural effects while remaining durable for a lifetime of use. Combining the blending qualities of a shammy as well as the dispersal properties of a pounce bag, the Charcoal Sachet rises to a new level of textural effects and produces large areas of value unmatched by any other drawing tool. The custom outer material is woven from a custom blend of threads for the highest level of use. Both the inner weight and outer dimensions are precisely controlled by our craftsmen to be up to the standards of professional artists. Each Sachet is embroidered with the Edge logo and comes with a custom leather pouch for protection and storage. If art is more to you than a hobby, and you believe in using only the highest quality tools, then the Charcoal Sachet is made for you.